It started in Houston, Texas…A brainstorming session created a crew called K.O.R.O., Knights of Rhythm Odyssey. Mario and Blas speak it into reality. Usual suspects on suspect streets introduced others, a scrapper named Sergio, an innovator named Ricky and Shadow, a guy whose feet I have yet to see touch the ground. The foundation was Hip Hop, House and Jazz. Jazz men where jazz lived in no ones vocabulary. Music was the movement, expression was the goal. Not knowing words like legacy, tradition, longevity they danced because that is all they had. On the other side of town, at risk kids create in the risky environments. Young kids, wet behind the ears who only had an ear for the breaks. 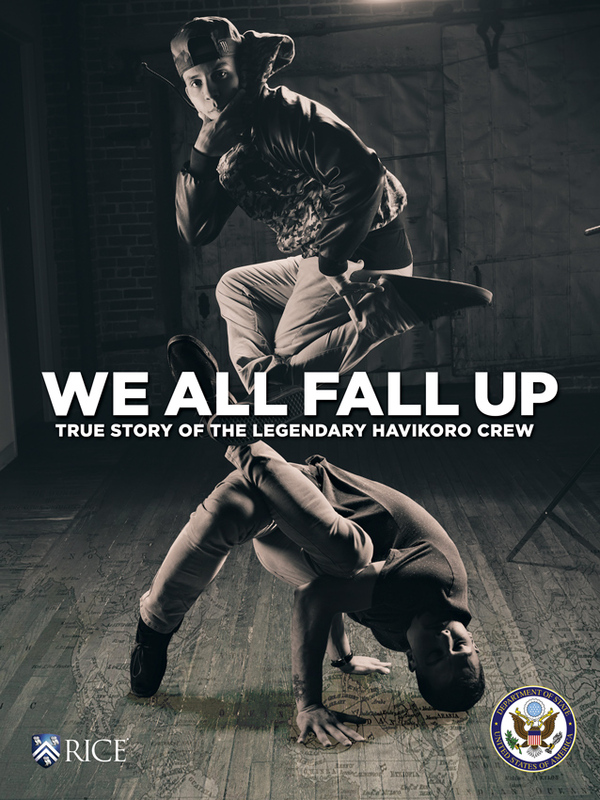 They create on unforgiving floors, their name tough like their neighborhoods, HAVIK they say… Having A Vicious Indestructible Krew, powerful kids with movement that shook neighborhoods who are suppose to only work and are not suppose to see nothing. Innovators who have yet to know the importance of the word. Running parallel for years created them competitors, meeting point a brotherhood. A simple idea of competition, and generic second hand education. It was in Cali, the Freestyle Session, The U.S. Out For Fame tour, the countless BBOY cities. The invite to Battle of the Year. Germany where the world got to meet the gunslingers from Texas that have never used the term cowboy. Havikoro crew a HIP HOP household name like detergent, with a dirty style that hums, so fresh and so clean, clean. The boys from the home of DRAPED OUT and DRIPPED OUT stumbled into something bigger. When your country calls you to represent the stars and stripes on an artistic level, We become that – The American Rebel. We rambled on, from spot to spot leaving marks in countries who can only lift up thumbs and peace signs and shout out HK! OK! And it was in Mexico, India, Guatemala, Nicaragua, Asia, Europe and so on and so on, where we interpreted those poems. Boys who created jazz men personas who eventually became knights, Created something new… A perspective on family, broken boys from broken homes who were never suppose to Break Out! This is just a story, a story of a collection of once upon of times that were never suppose to meet. A story of a world to big to see and boys who were never suppose to see it, let alone change it. A brotherhood who throws lefties and have always had an awkward stance, Havikoro they say… Havikoro Crew we are. A percentage of proceeds raised from the our film event/s will be donated to BreakFree Community Center, a non-profit organization established in 2011 to create life changing Hip Hop art programs aimed at reaching at-risk youth in a positive manner. The BreakFree Community Center was created by Moy Rivas a founding member of Havikoro crew. In the early 90’s two dance groups created within years apart from each other set out on a journey that would redefine their lives for better or worse. And for the last 22 years the art and culture of steet dancing has influenced, impacted, and paved the paths of their lives cementing their friendship into a brotherhood that has taken them around the globe to over 40 countries influencing countless lives. From modest backgrounds to ambassadors of their dance working with the U.S. embassy this is a story of love and sacrifice for an art born through the rhythms of the urban soundtrack. Video and photography of Havikoro's adventures around the world. Your visit was a great success reaching over 2,500 Nicaraguans with your innovative dance, dynamic talks and contagious energy in the cities of Somoto, Esteli, Bluefields, and Managua. I appreciate your dedication to promoting greater understanding of U.S. culture through hip hop and commitment to engaging at-risk youth through positive life messages. You guys absolutely rocked it… we were all floored, man. Seriously, that was a HUGE highlight. Cannot thank you enough for participating and organizing the guys.